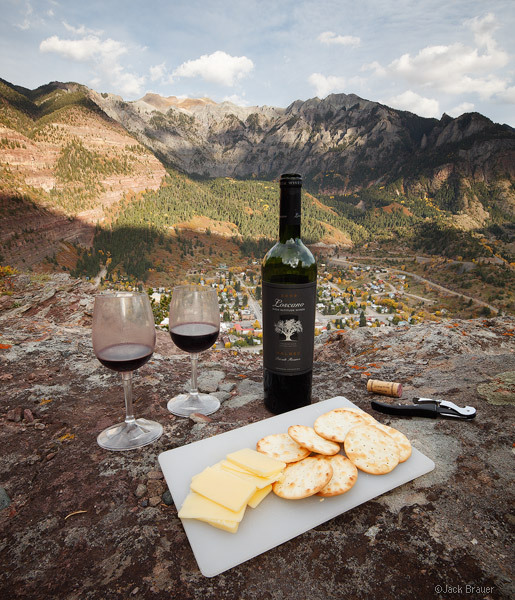 Here’s a photo of Ouray, as seen from our new favorite “wine and cheese” spot. “Wine and cheese” you ask? Yes, one of Claudia and I’s favorite ways to unwind is to haul a bottle of wine and our plastic wine glasses up to a viewpoint and relax for the evening. Especially after a day stuck inside in front of the computer, fresh air and a fresh perspective works wonders to clear the head. Not to mention that wine is good for you, and so is hiking… a win-win situation! Claudia and I have gone on wine hikes in Peru, Argentina, Chile, Germany, and Switzerland. Someday we will co-author a guidebook to the world’s best wine and cheese spots. The only problem with that plan is that I know next to nothing about wine, and definitely nothing about writing about it! So maybe it will be a picture book instead, with scratch-and-sniff stickers. Lest you think I’m just joking around about all this, I officially own the domain name WineHiking.com. Yes, that was a spontaneous purchase, but hey… you never know! Here’s my first attempt at the photos I’ll need to be taking for our wine hiking encyclopedia. Here we have a tasty Malbec from Mendoza, along with some kind of Swiss cheese. It was good. I liked it a lot. 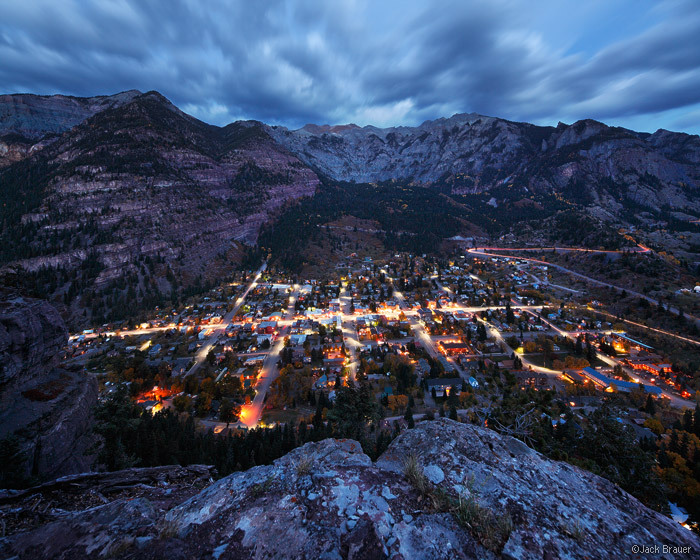 Posted in Colorado and tagged Colorado, Ouray, San Juans on October 7, 2012 May 19, 2013 by Jack Brauer. Photography Life, a popular Colorado-based photography website, just published a guest blog post by yours truly, titled “Originality in the Grand Landscape”. In the article I attempt to explain how creativity with grand scenic photography goes beyond just framing and taking the photos; it involves the entire process including researching unique locations, coming up with original ideas to shoot, and the adventures to get to the right place at the right time. To date this is my most comprehensive attempt to illustrate my own photographic strategies, motivations, and tips, and I hope that it will provide inspiration for aspiring landscape photographers. Posted in Articles, Publication on October 7, 2012 by Jack Brauer. 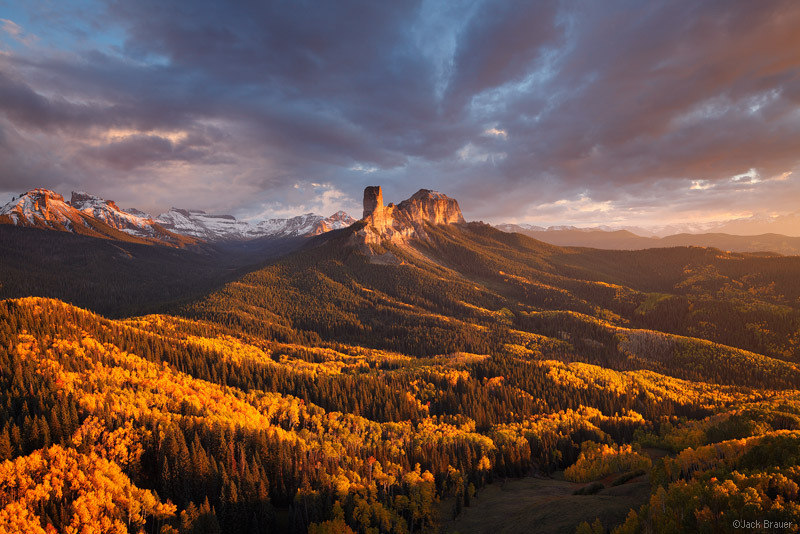 Sunset light on Chimney Rock and Courthouse Mountain in the Cimarron Range near Ridgway, Colorado - September. Yesterday I witnessed a spectacular sunset from a high perch in the Cimarrons, the rugged mountain range east of the town of Ridgway. This range gets fantastic sunset light, since there are no peaks to the west to block the last rays of the setting sun. During a previous hike up Precipice Peak earlier this summer (visible on the left side of the photo above), I had scoped out this possible overlook point, and I finally took the opportunity yesterday to bushwhack up there. Well, the view was even better than I expected, and the sunset was too! This is one of those photos that just has to be viewed large; I would love to make an enormous print of this… and huge prints are certainly a possibility with this multi-shot stitched panorama. 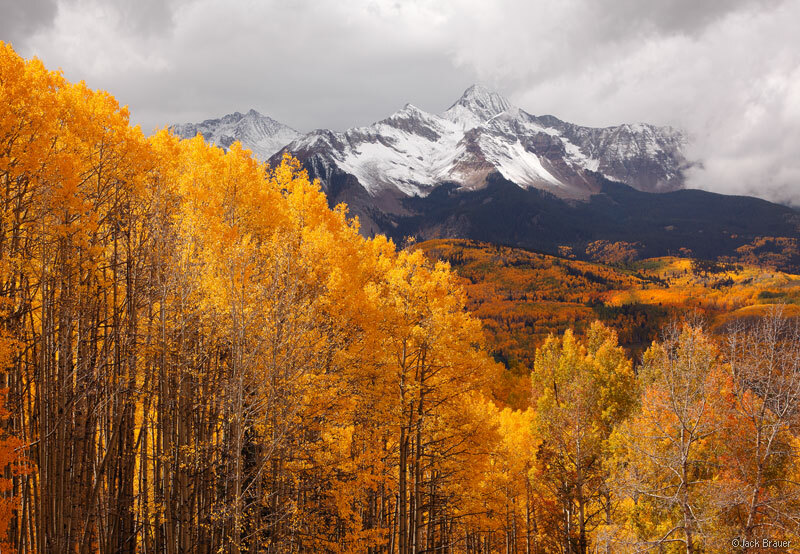 Posted in Colorado and tagged Colorado, San Juans on September 29, 2012 May 19, 2013 by Jack Brauer. A stormy sunrise above Dolores Peak and the vast aspen groves of the Fall Creek valley near Telluride, Colorado - September. With the autumn colors at their peak and fresh snow dusting the mountains, we spent the last two days driving around and camping out in the Telluride area. 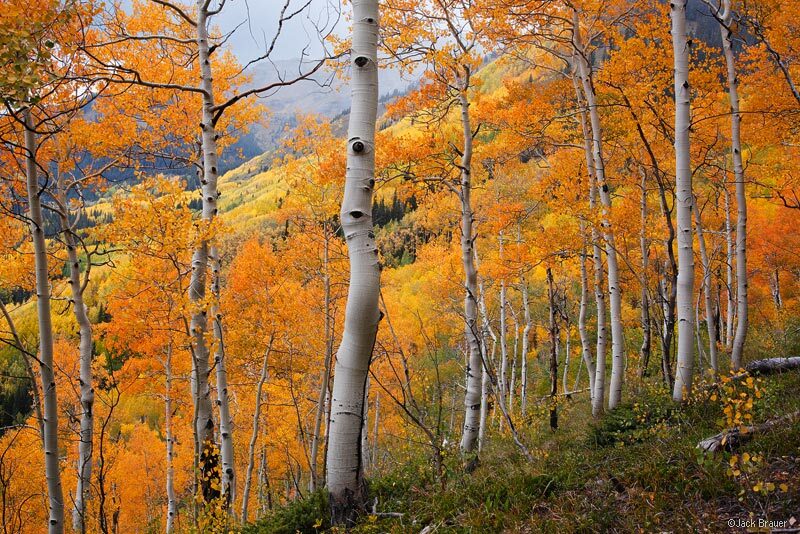 This is a great autumn for the aspens this year – the colors are brilliant and there are lots of oranges and reds mixed in. The cloudy/stormy/misty skies provided the perfect atmosphere and light for geeking out with the camera all day long, from dawn till dusk! An aspen with a view of many more aspens. 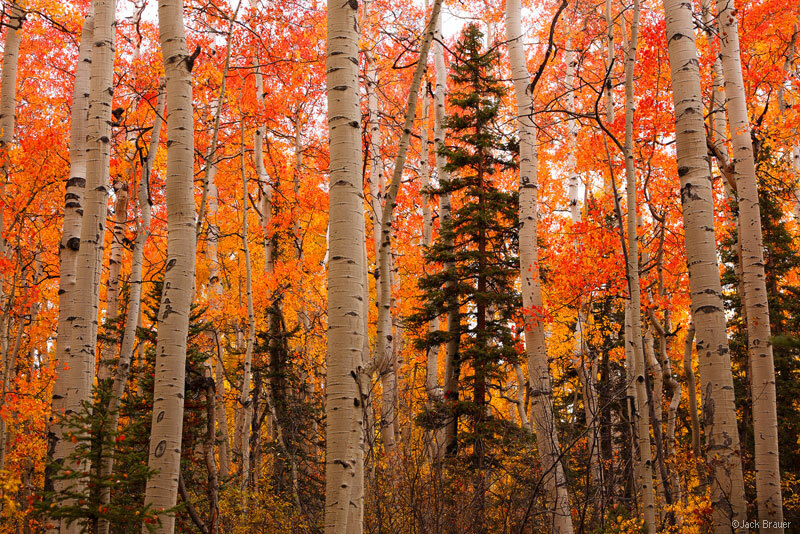 A rare grove of brilliant red aspens in the San Juans - September. 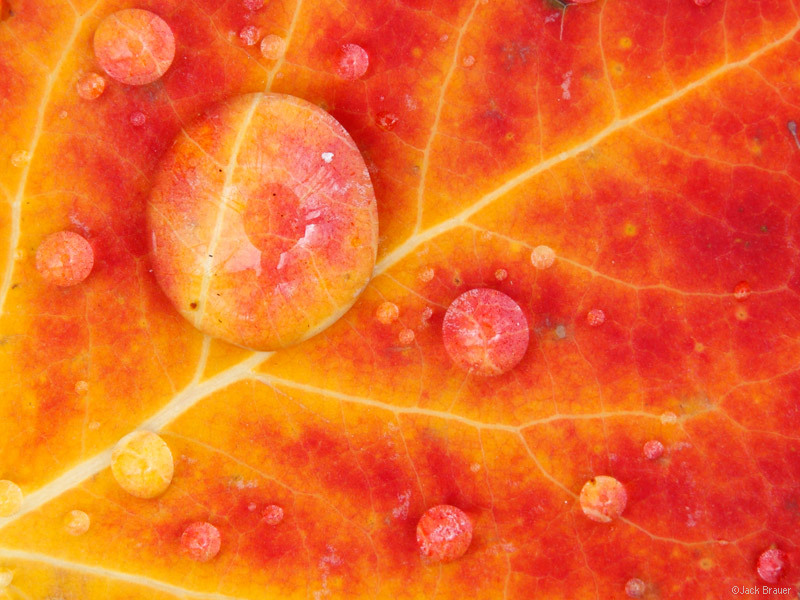 A close up shot of raindrops on a red and yellow aspen leaf. 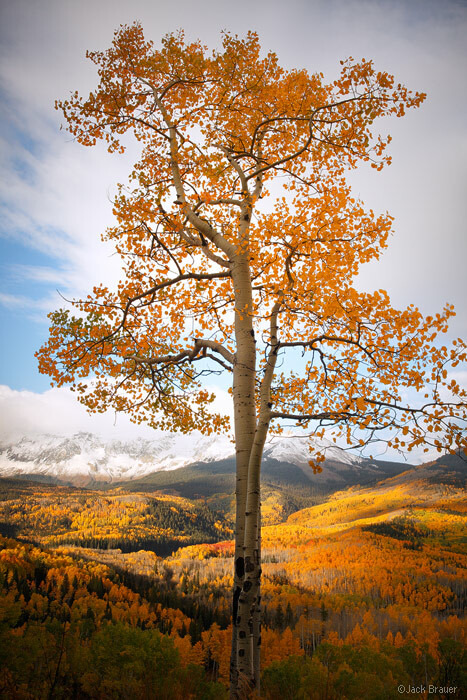 Brilliant aspens and view of Wilson Peak, the famous fourteener near Telluride, after the first snows of autumn. 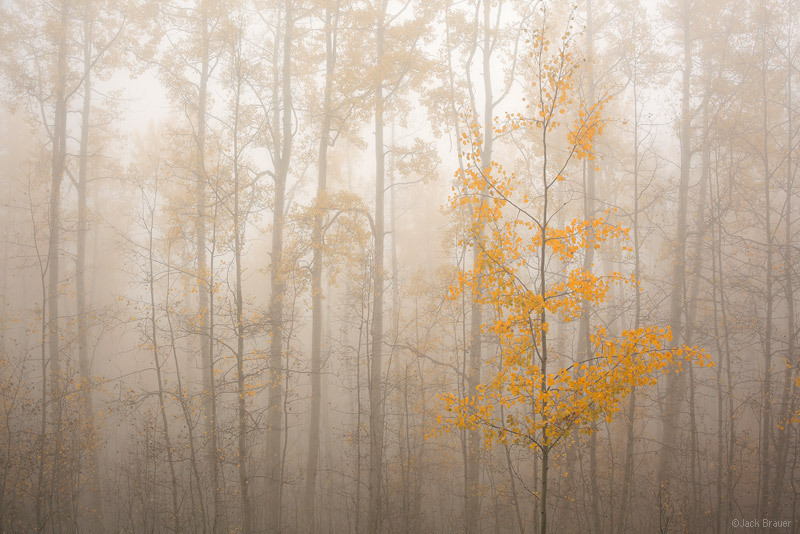 Aspen forest in the fog - September. 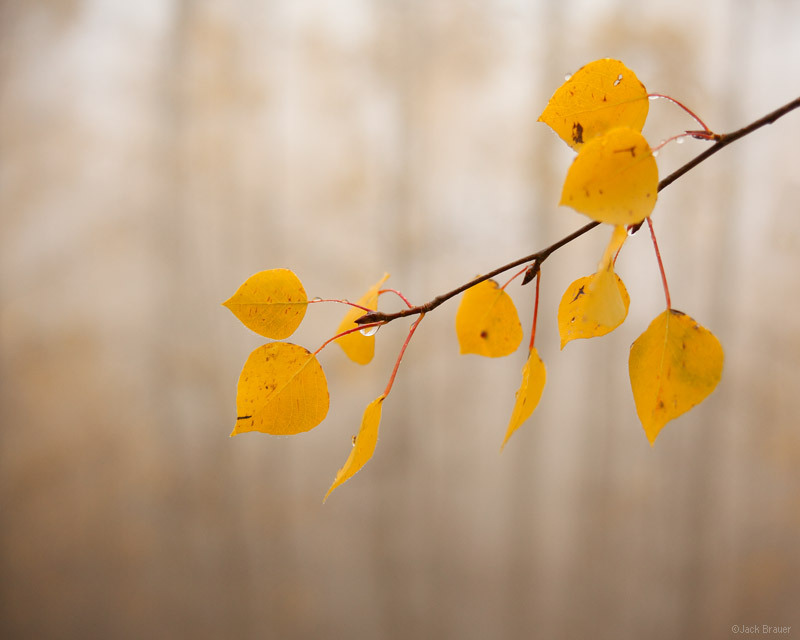 Aspen leaves in the rain and fog - September. Clouds lift off of Wilson Mesa and Wilson Peak after an afternoon autumn storm, as seen from Last Dollar Road - September. 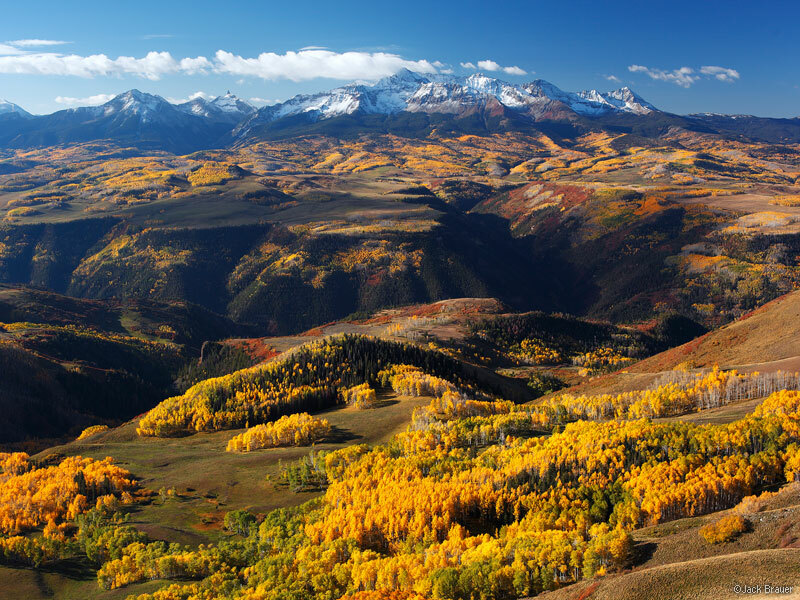 A sweeping view of Wilson Peak and Wilson Mesa and its many aspen groves, as seen from Last Dollar Mountain - September. 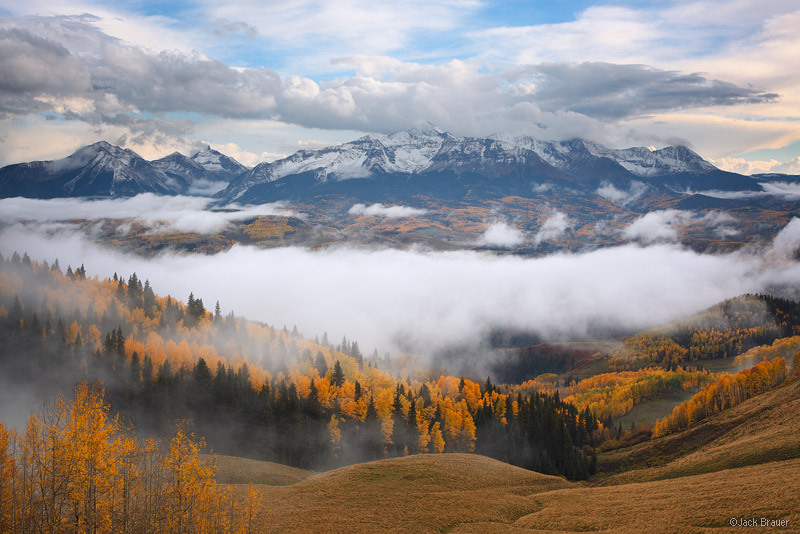 Posted in Colorado and tagged Colorado, San Juans on September 27, 2012 May 19, 2013 by Jack Brauer. The aspens up on Red Mountain Pass are going off right now! 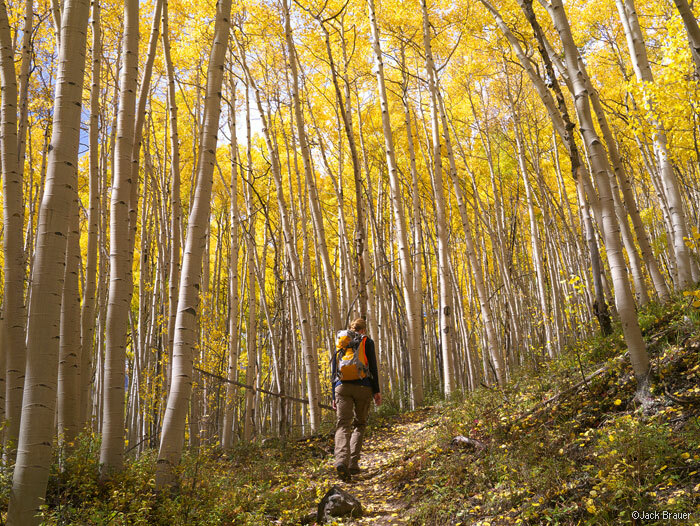 Today we went on a fantastic loop hike almost entirely through these golden cathedral forests. 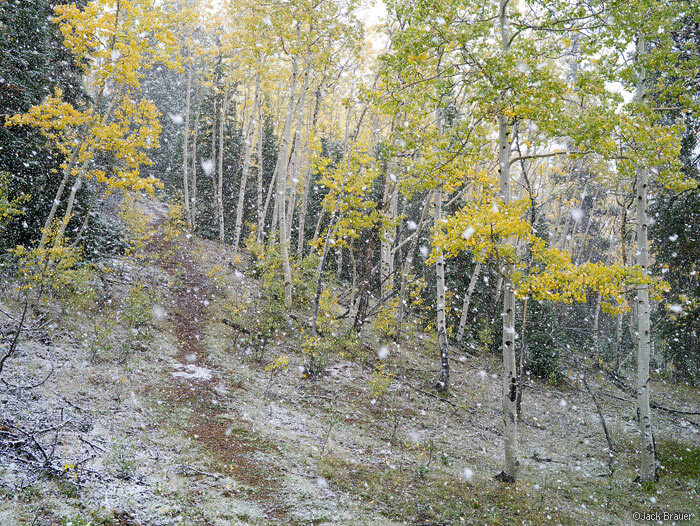 We were surprised when it started snowing – the first snow of the year! Claudia was a bit dismayed… I was delighted! We sat under a pine tree for a while, mesmerized by the fat flakes drifting down. The snowstorm passed quickly and the sun came out, melting the new snow within about 15 minutes. 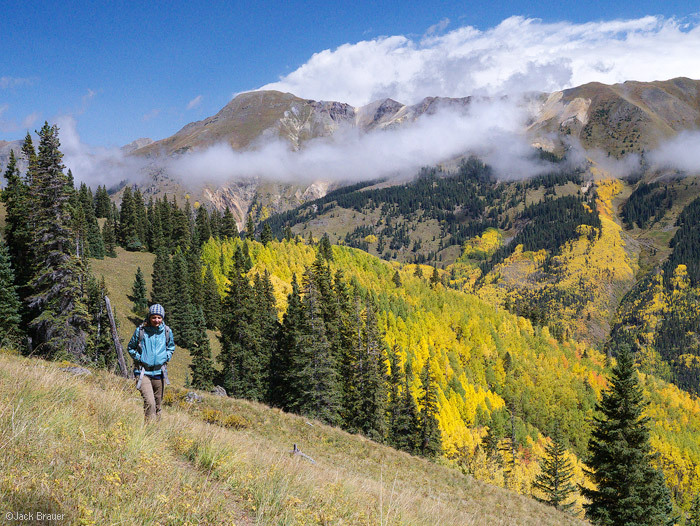 We continued on our way and eventually after a bit of easy bushwhacking found an old overgrown mining trail that offered a nice loop down through a different aspen-filled ridge. 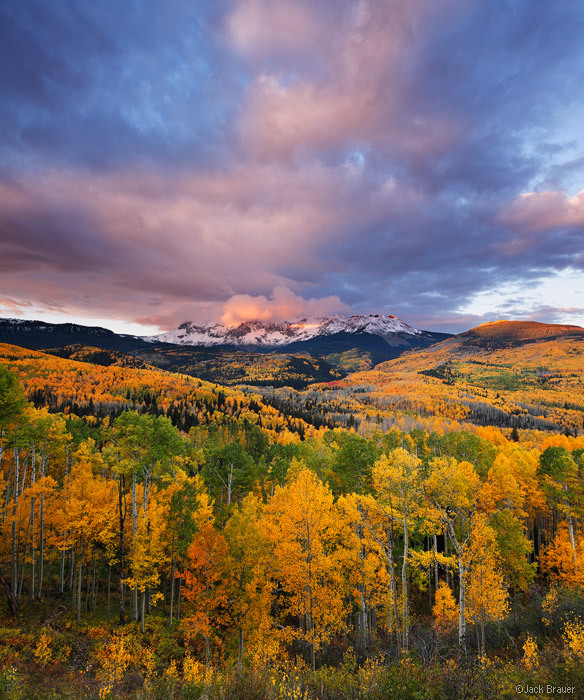 Posted in Colorado and tagged Colorado, San Juans on September 17, 2012 May 19, 2013 by Jack Brauer. This last weekend we did a little road trip up to Marble to spend the weekend with my friends in their cabin there. 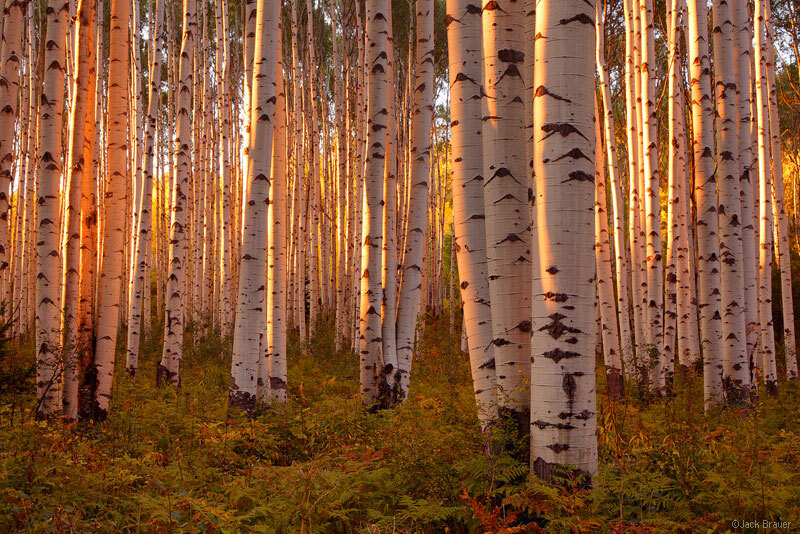 On the way over McClure Pass on Friday evening, I had to slam on the brakes and pull over to shoot this awesome sunset light shining through the aspen forest. On Saturday Ann led us on a wonderful hike up a lesser known basin on Treasure Mountain, with ever-present views of Snowmass Mountain towering across the valley. We were planning on doing some other kind of car-camping/backpacking adventure in the West Elk Mountains after that, but with the aspens on Kebler Pass still mostly green, along with a sudden bout of indecisiveness and lack of motivation to go backpacking, we ended up just driving back home to the San Juans! Not a bad option either. Posted in Colorado and tagged Colorado, Elk Mountains on September 17, 2012 May 19, 2013 by Jack Brauer. 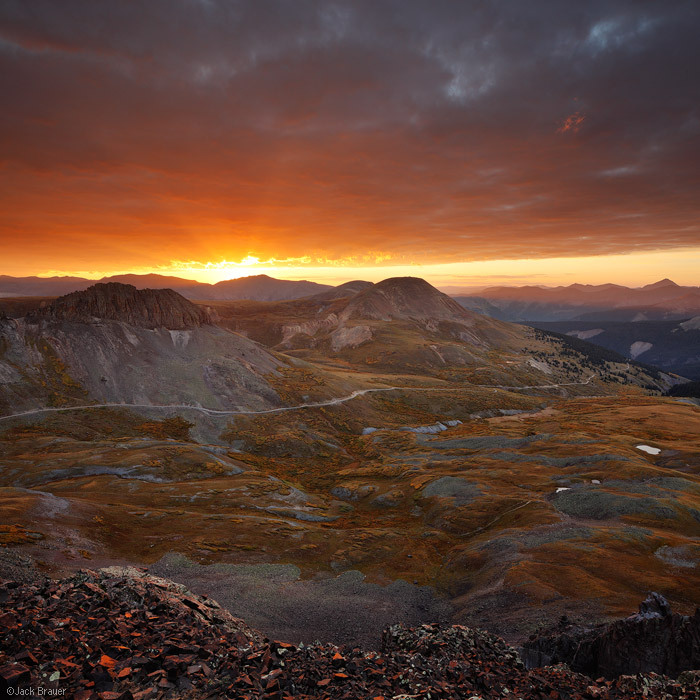 A spectacular sunrise over Stony Pass, east of Silverton - September. Desiring a leisurely change of pace after our recent tiring backpacking treks, Claudia and I decided to go car camping this weekend up on Stony Pass east of Silverton, Colorado. 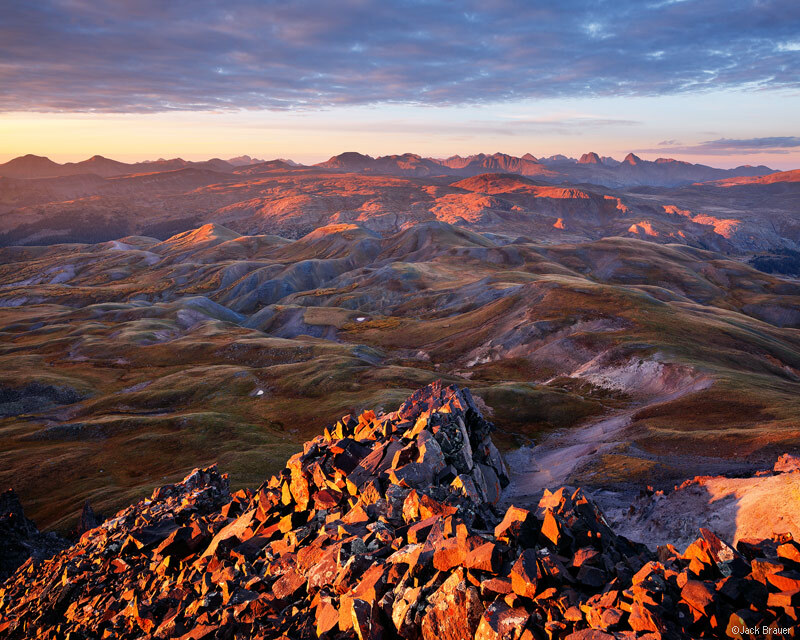 Sunrise atop Stony Pass Peak, looking over the high rolling tundra of the northern Weminuche Wilderness towards the Grenadier Range - September. Nearby Stony Pass Peak provided an easily-accessed wonderful vantage point over the rolling tundra of this area and the rugged Grenadier Range in the distance to the south. 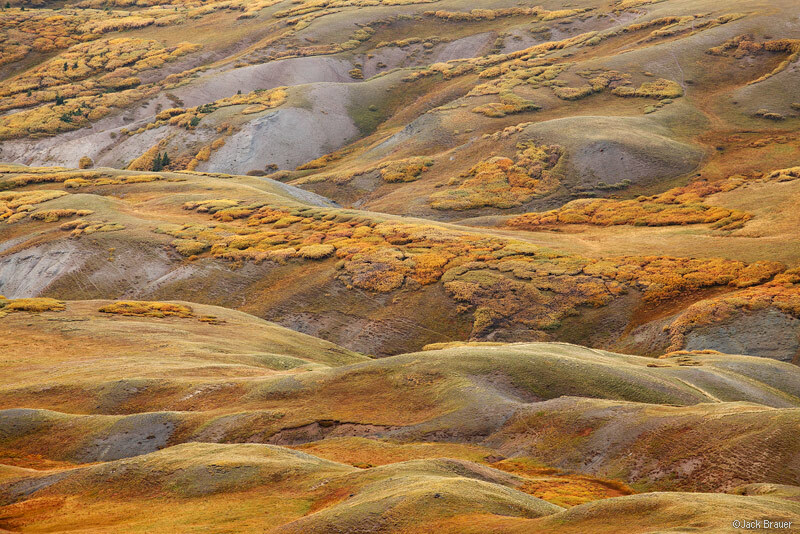 The contours and textures of the tundra around here make for fantastic abstract photo opportunities with a telephoto lens, especially with the golden autumn colors! 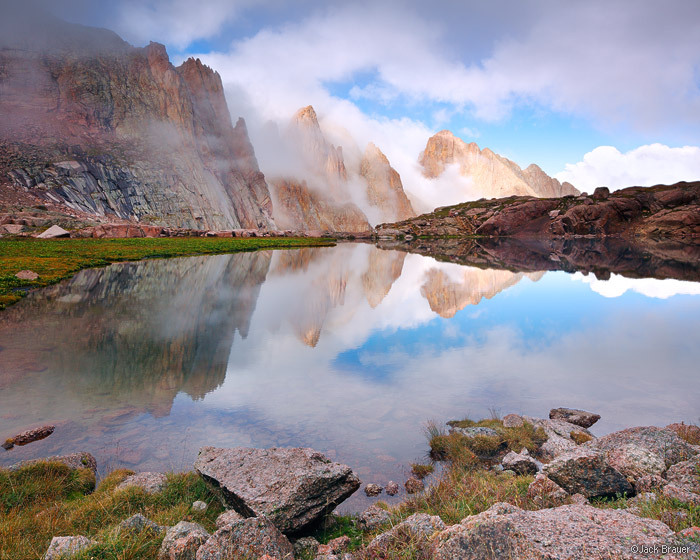 Posted in Backpacking & Trekking, Colorado and tagged Colorado, San Juans, Weminuche on September 11, 2012 November 25, 2013 by Jack Brauer. 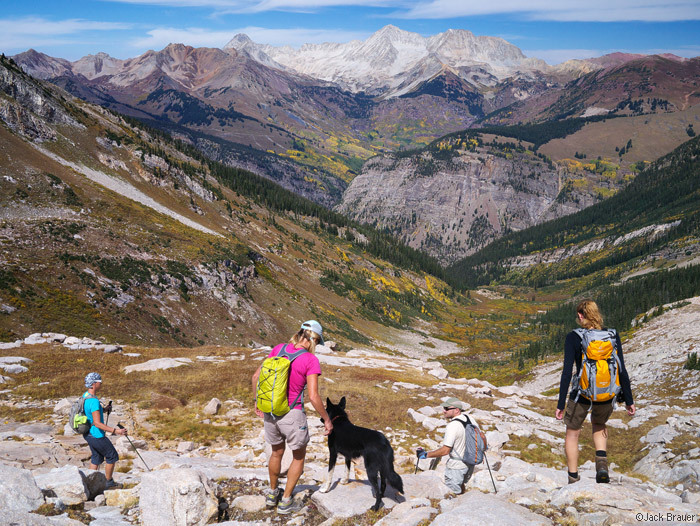 Over Labor Day weekend some friends joined us for a strenuous 3-day loop trek in the Weminuche Wilderness, south of the area we hiked through last week. The weather was a bit wacky during this trek – ominous clouds threatened rain and thunder during the days, but the rain only came during the night. 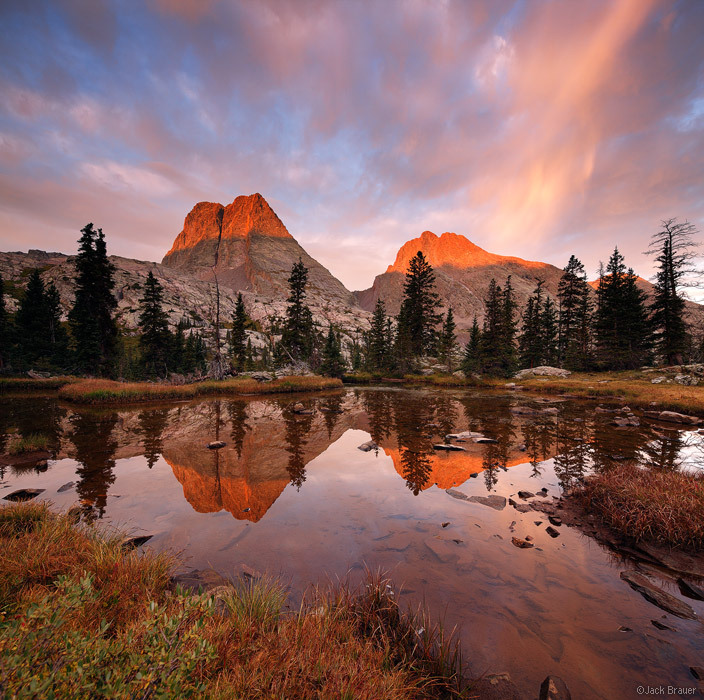 Posted in Backpacking & Trekking, Colorado and tagged Colorado, San Juans, Weminuche on September 4, 2012 November 25, 2013 by Jack Brauer. Storm clouds break up and lift off of the Needle Mountains, in the high Weminuche Wilderness - August. 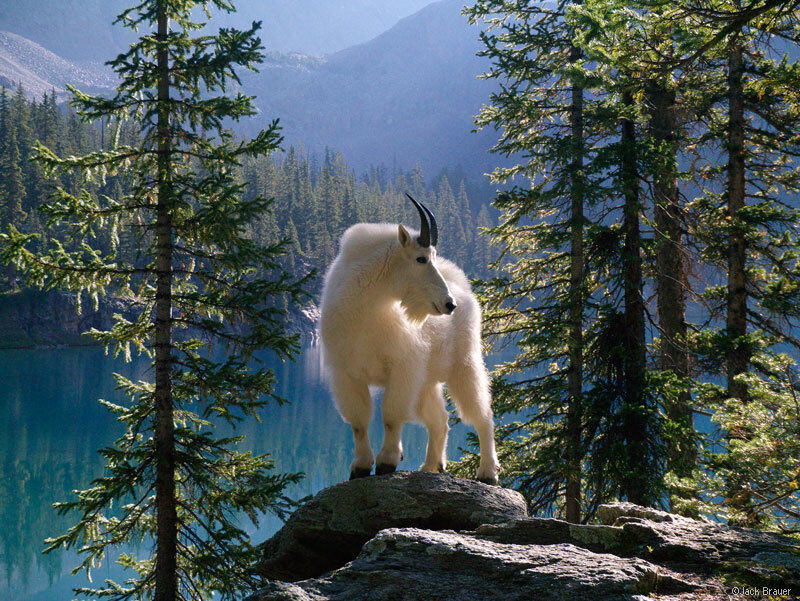 Mountain goat in the Weminuche Wilderness. Reflection of the Grenadier Range during a fiery sunrise. 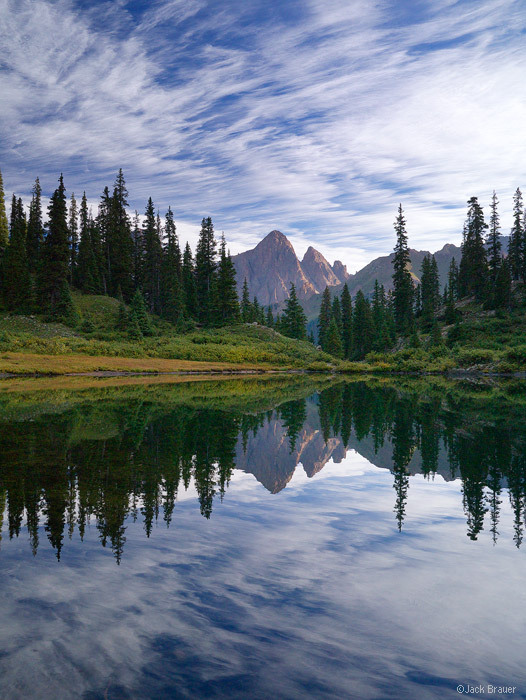 Posted in Backpacking & Trekking, Colorado and tagged Colorado, San Juans, Weminuche on August 30, 2012 November 25, 2013 by Jack Brauer. 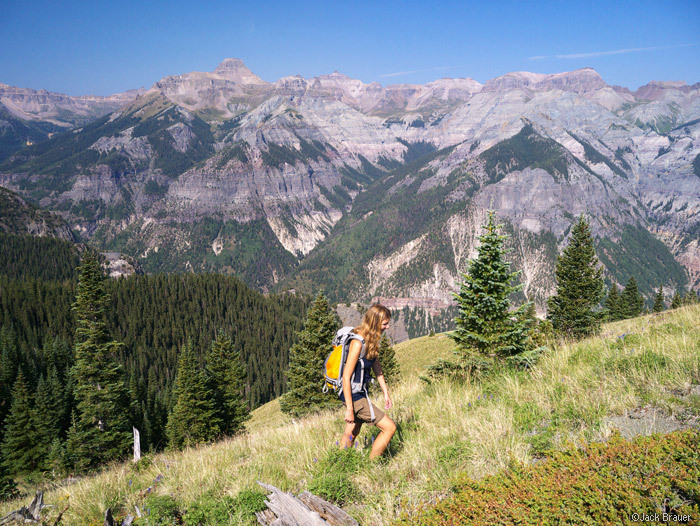 Hiking the Hayden Trail, with Potosi Peak and Weehawken valley of the Sneffels Range in the background. We started my birthday off right this morning with a hike up Hayden Mountain, high above Ouray. We found a new ridge-route to an awesome overlook point that I never realized was there, despite having hiked up past here numerous times before. 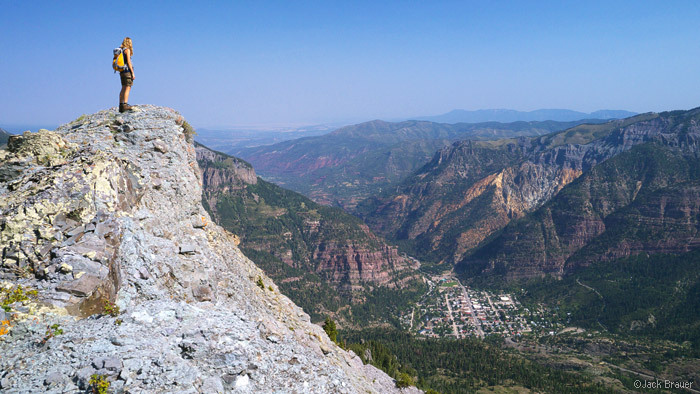 This is definitely now one of my favorite Ouray hikes, along with the Bridge of Heaven on the opposite side of Ouray. 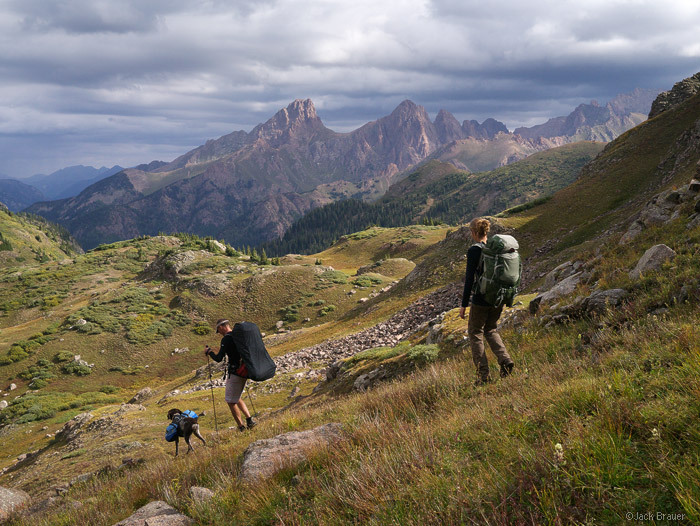 We are excited to finally go backpacking again in a couple days – for a week long trek in the Weminuche – woohoo! Posted in Colorado and tagged Colorado, Ouray, San Juans on August 19, 2012 May 19, 2013 by Jack Brauer.